CAMP LIFE ISN’T ALL FUN AND GAMES. THOUGH THERE’S PLENTY OF THAT TOO. WHAT MAKES OUR SUMMER CAMP DIFFERENT? THE SAME THINGS THAT MAKE THEM STRONGER. Camp Manito-wish YMCA has a reputation for offering a unique brand of Summer Camp. What makes us so special? The near-century of success we’ve had by honoring and continuing our traditions, and our commitment to collaborative leadership, character and leadership development and wilderness tripping. These practices — built upon our history, heritage and experience — may sound unusual. But they’re also effective in helping to develop character and leadership skills. That’s why we continue to embrace them. And interestingly enough, so do the campers! Explore the links at right for specific examples of what makes the Manito-wish experience so distinctive. Our cabins are more than collections of log and timber. They’re a camper’s hang-out place, rustic retreat, and home away from home. So we make sure they’re comfortable, accommodating and well-maintained. Each cabin has its own name, as well as a unique floorplan. But they all share several features in common. Every cabin has a sitting room with wood-burning fireplace for cool summer nights and a bunkroom that accommodates approximately twelve (two counselors and eight to ten campers). Some “double cabins” provide two bunkrooms and an enlarged sitting area. Washhouses with showers, sinks and toilets are located a short walk from all cabins. 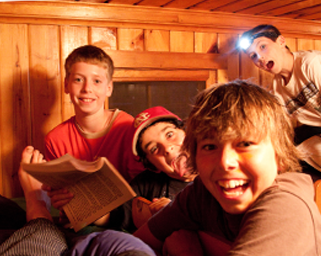 Campers stay in their cabins with other campers of similar age, along with two counselors who are the same gender as the campers. The cabin group is the nucleus of the Manito-wish community — sharing meals, wilderness trips, and attending afternoon program activities together. They also share in the upkeep of their cabin, pitching in each morning to clean, sweep and tidy up their rustic home. In this way, they learn responsibility, build character and help their fellow cabin-mates keep a comfortable, cozy home. SO HEALTHY THEY WILL KEEP AN ACTIVE CAMPER GOING STRONG. SO TASTY THEY WILL NEVER SUSPECT A THING. Summer Camp requires plenty of energy, and at Camp Manito-wish YMCA, it’s delivered in the form of a delicious and diverse menu . Most days, campers gather in historic Nash Lodge for hearty breakfasts, lunches and dinners, prepared under the expert eye of Chef Rudy Valadez. (Taste, nutrition and food allergies are always taken into account.) On Trail, campers plan, pack and prepare their own meals over the campfire, resulting in appetizing (and often creative) dishes. So whether your camper is enjoying beef stroganoff at the dining table or hunkering down for “ickabrunch” at the campsite, they’ll be well-fed and well-fueled for the days ahead. THE BEST ARGUMENT YET FOR A 36 HOUR DAY. At Camp Manito-wish YMCA, every day provides new opportunities for high energy activity, challenge, relaxation and friendships. When they aren’t out on Trail , our campers’ days are structured to encourage them to explore their individual interests, get to know their cabin mates, and participate in larger, group activities. The activities are designed to teach our character values of caring, honesty, respect and responsibility. Explore our daily calendar to learn more! Evening activities might include a large group game of Capture the Flag, an all-camp campfire, special entertainment or the Camp Show! Time spent at Manito-wish is what summer dreams are made of. Riding horseback through the forest, sailing under the blue sky, making a new friend, singing by the campfire, jumping into the refreshing lake, learning how to set up a campsite, paddling a canoe, going out on trail . . . each day is full of new adventures. On land and water, there’s an incredible variety of experiences to choose from, every one of them exciting and enriching. Explore the links below or our interactive Summer Camp map for more information! THE WEATHER. THE TERRAIN. THE CHILD. 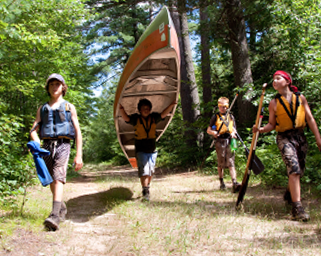 During every Summer Camp session, each camper will experience “Trail.” This uniquely Manito-wish experience sees small groups (two counselors and four or five campers) packing provisions and gear and venturing out into the northwoods wilderness. Their destination: Any number of rustic, undeveloped campsites along their route. The duration: Two to seven nights, depending on their age and experience level. Their goal: Adopt new outdoor skills, explore the natural world and learn something about themselves. Along the way, they’ll camp, cook, travel and put their leadership skills to the test. They will be amazed, inspired and challenged. And they’ll return with newfound confidence in their leadership and abilities. It’s a transformative experience that puts them on a positive path, ready to achieve any goal they choose to set for themselves. But one thing’s for certain: They’ll set that bar high. 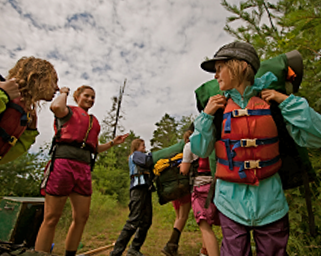 Every evening, campers are assigned responsibilities, both in-cabin and out. It’s our way of instilling responsibility to your cabin, cabin-mates and the camp community. Part of helping campers learn about themselves and the world around them is introducing them to the spiritual nature of life. By attending nondenominational Sunday service in our outdoor chapel and singing grace before every meal, campers gain a better understanding of the power that connects us all. Going “on trail” isn’t just a tradition at Manito-wish and one of the features that make us truly unique; it’s an integral part of every summer camper’s Manito-wish experience. All summer camps offer programs and activities; what makes Manito-wish unique is our focus on what are commonly referred to as “silent sports,” or non-motorized activities. We believe these activities allow for greater focus and concentration and allow for a closer connection with nature and the world around us. Even at an early age, having members of the opposite gender around can have campers acting out and feeling self-conscious. 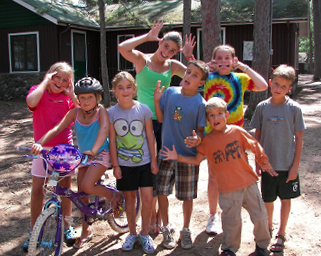 At Manito-wish, we hold separate boys and girls sessions to help campers relax and be themselves. See our camp options here. Camp Manito-wish YMCA Summer Camp employs both men and women on staff. Their roles are reflective of the sessions and genders we’re serving. 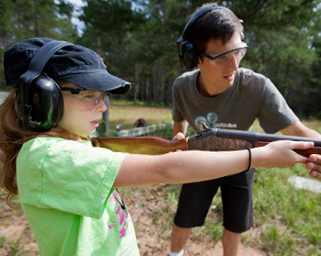 For boys’ camp, males serve as cabin counselors and Trail leaders; for girls’ camp, females assume those roles. In our program areas, activities are taught and supervised by both genders. Cell phones, pods, pads, games and other electric devices are not allowed. We believe that disconnecting is the best way to reconnect with friends, neighbors and the world around you. 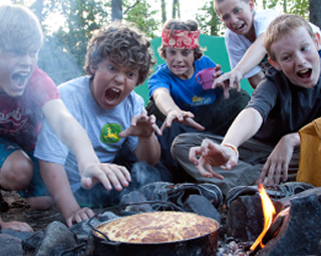 Many summer camps are purely fun-oriented. Manito-wish campers have plenty of fun, too — but they also have their share of responsibilities and challenges. Through this unique and balanced approach, they gain more than great experiences and new friendships — they build confidence and self-esteem. Parents are welcome to communicate with their campers, but only by letters or email ( which is printed and delivered as daily mail). Campers can send hand-written notes through standard mail. It’s an effective way to forge an appreciation for family and build good writing and communication skills. For the Summer Camp program, a visiting day is offered on a specific day during the session (advance notice is always provided), usually from 10:30 a.m. to 2:00 p.m. Upon arrival, please check in at the Boyce Administration Building and we’ll locate your camper. You may join them for Chapel Service and lunch (at lunch, visitors sit together and campers remain with their cabin group). Guests are welcome to visit the program/public areas of Camp, but not allowed in cabins or cabin areas. We also require that all campers and visitors stay on Camp property during their visit. Please contact Camp in advance to make sure your camper isn’t on Trail during the visiting day.